With Brexit in disarray, it’s hard to imagine that European Union leaders will have more pressing matters on their minds when they meet in Brussels. And yet their two-day summit beginning on Thursday includes existential topics ranging from trade relations with the bloc’s biggest economic partners, to resolving differences over how to save the planet from catastrophic climate change. Here’s a look at some of the other open fronts keeping heads of state awake at night and busy in Brussels. 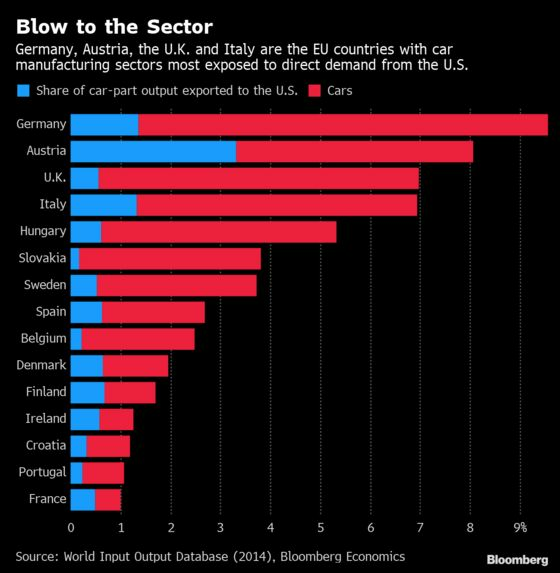 Germany is eager to start talks with the U.S. on cutting industrial tariffs to keep at bay automotive levies that President Donald Trump has threatened, a move that could have a crushing effect on the European car industry. 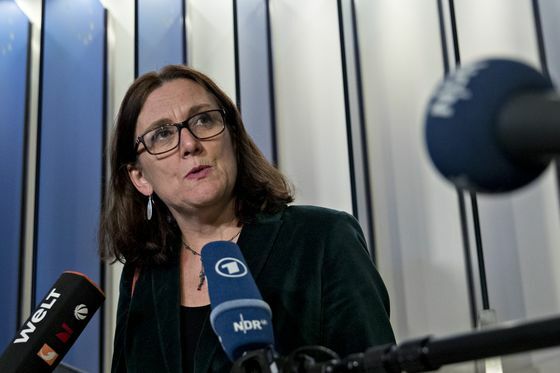 Eyes are on France for clues about how long it’ll keep dragging its feet over a negotiating mandate for European trade chief Cecilia Malmstrom. She asked in January for the green light to start discussions, which must come from all EU governments. The EU has already begun preparations in the event talks with the U.S. falter and has promised to hit 20 billion euros ($22.7 billion) of U.S. products with tariffs if Trump imposes the automotive duty. Over dinner on Thursday, leaders will prepare for the EU-China summit due to be held in Brussels next month. The draft joint communique, seen by Bloomberg, is being spinned as the most ambitious offer to date for engaging China and bringing the world’s most populous country into the rules-based international order. 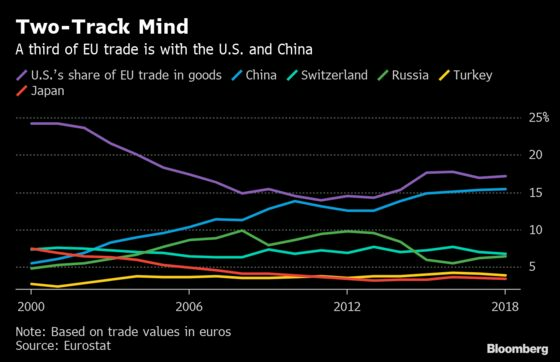 The EU wants Beijing to commit to completing a trade accord removing barriers to the Chinese market for European companies. The document is also an attempt “to save the World Trade Organization” by reforming it, amid a U.S effort to stall its functioning. The summit discussion on China takes place against the backdrop of Chinese President Xi Jinping’s visit to Rome on Thursday, during which he will offer Italy a “global strategic partnership” stretching from building the new Silk Road together to boosting ties in sensitive sectors including telecoms and ports. Italy will be the first Group of Seven country to sign a Belt and Road memorandum, fueling U.S. concerns about an open door for China into strategic sectors like telecoms and ports. Even though leaders won’t issue conclusions from their discussion on China, Beijing will be watching closely. That’s because leaders will separately invite the European Commission to recommend a “concerted” approach to procurement for next-generation mobile networks, also known as 5G. The EU is under immense pressure from the U.S. to restrict the use of Chinese equipment in these networks for national-security reasons. Trump’s administration argues that Chinese laws oblige companies to help the state in espionage operations and therefore the use of hardware from companies such as Huawei would make Western countries vulnerable and susceptible to spying. Looking globally, the EU leaders will instruct their officials to try to surmount a deadlock over draft legislation from 2016 aimed at prying open procurement markets abroad. The proposal would hand the European Commission new investigative powers and allow a “price penalty” to be applied to bids in the EU by companies based in foreign countries that have discriminatory procurement practices (culprits include China, Indonesia, India and Russia, according to the bloc). A watered-down version of a 2012 initiative, the latest plan still faces ideological resistance in a group of mainly western European countries. EU leaders are dealing with the fall-out of a bruising battle over the attempted tie-up between Siemens AG and Alstom SA. 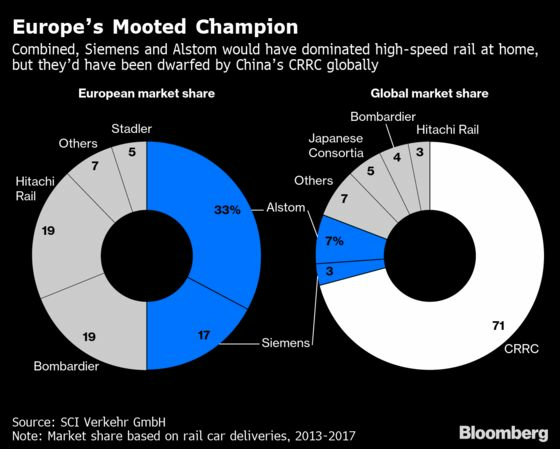 A French and German dream of a train giant able to take on China was killed off by the EU’s antitrust chief last month. That prompted Paris and Berlin to call for governments to have a say in deals they think are crucial to Europe’s future, running against 60 years of independent merger reviews. While French President Emmanuel Macron and German Chancellor Angela Merkel didn’t get leaders to back their call for big changes to the way mergers are handled, they got support for “an assertive industrial policy” and a commission initiative that could create obstacles for Chinese state-owned firms in Europe. The pace and means of shifting to a green economy is set to divide EU leaders when they start debating a long-term climate strategy. The European Commission proposed in November that the bloc becomes the world’s first major economy to go for net-zero emissions by 2050. Planning ahead is necessary to give direction to companies and citizens to anticipate costs in fighting global temperature increases.